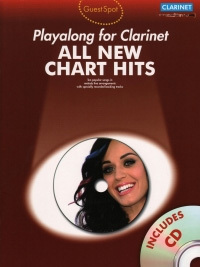 Guest Spot All New Chart Hits Clarinet Book & CD. Step into the spotlight and play along with the backing tracks on the specially recorded CD. Ten of todays best chart hits.Songs include, The A Team, All About Tonight, Every Teardrop is a Waterfall, Glad You Came , Grenade, Jar of Hearts, Jealousy, Lasy Friday Night, Love Goes Down, Someone Like You.